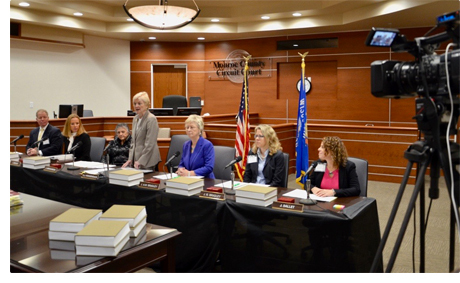 The Justice on Wheels program takes the Wisconsin Supreme Court on the road and gives people outside Madison a chance to observe the Court in action during an oral argument. Since 1993, the program has brought the Court to more than two dozen locations, including Green Bay, Eau Claire, Wausau, Milwaukee, La Crosse, Superior, Janesville, Kenosha, Baraboo, Rhinelander, Juneau, Appleton, Stevens Point, Racine, Portage, Fond du Lac, Elkhorn, Wautoma, Hudson, Oshkosh, West Bend, Portage, Sheboygan, Waukesha, Grant, Bayfield, Jefferson, Monroe, and Sparta. More than 10,000 people have witnessed or participated in Justice on Wheels. The proceedings attract a standing-room-only crowd. Before each argument, local attorneys provide the audience, including students and teachers, with an explanation of the case to be heard and a short civics lesson.